Greetings from Bangladesh Society for Human Resources Management (BSHRM). 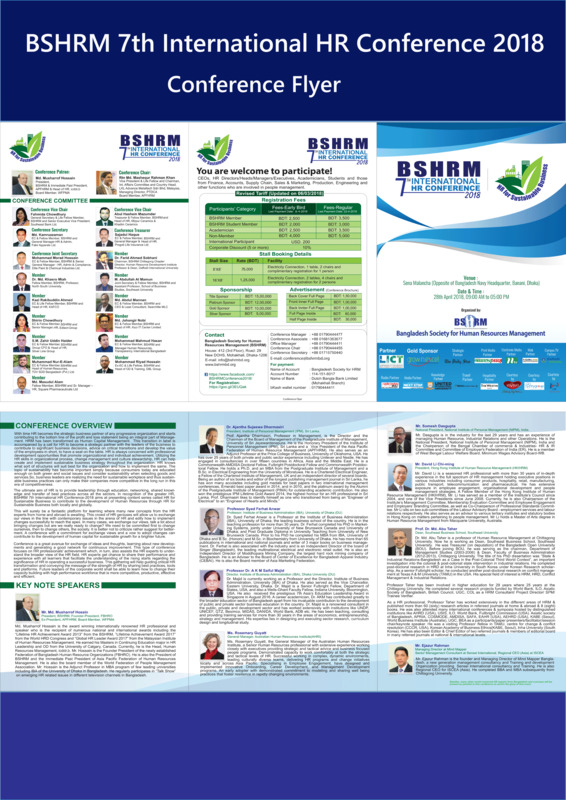 We are delighted to inform you that BSHRM is going to organize "BSHRM 7th International HR Conference – 2018" on Saturday, 28th April 2018 at Sena Malancha, Dhaka, Bangladesh. We cordially invite you and your HR associates, heads of functional departments and any other interested persons from your organization to participate to BSHRM 7th International HR Conference – 2018. The event will allow you to share knowledge, meet, interact and network with a large number of HR leaders, Corporate CEOs, renewed HR & Management professionals of different business segments, academicians, students of the universities and the other stakeholders. President, Institute of Personnel Management (IPM), Sri Lanka. Registration is in progress. You are cordially requested to confirm your registration at your earliest.